Fonatur, Mexico’s tourism-infrastructure developer, recently posted a uniform price structure for slips in its eight Marinas Turistica around the Sea of Cortez, although none of Mexico’s 30 other independent marinas have followed suit — so far. The new price structure, posted in Mexican pesos, raises the earlier charges for slips, moorings and dry storage at some marinas, while bringing them in line with other marinas in the Fonatur group. The exchange rate between U.S. dollars and Mexican pesos has ranged over the last 120 days from $1:11.4 pesos up to the current $1:13.2371 pesos, according to bloomberg.com. The recent fluctuation of exchange rates for Mexico’s historically steady peso is due to current uncertainty about Europe’s financial stability, according to a Sept. 21 Mexico Business Web news service report. Fonatur’s newly posted prices have changed twice recently, evidently in response to the changing dollar-to-peso exchange rate. Marina details are posted with a notice that prices may change without notice. All the Fonatur-built marinas constructed in the past decade were formerly called Singlar Marinas, but they are now called Marinas Turistica. 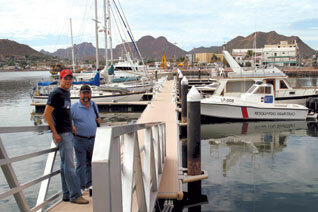 The name is used along with the individual marina’s location: for example, Marina Turistica La Paz. For slips and mooring buoys at Marinas Turistica in La Paz, Puerto Escondido, Santa Rosalia, San Felipe, Puerto Peñasco, Guaymas, Mazatlan and San Blas, the new daily rate — including 11 percent IVA (value-added) tax — is 68 cents (U.S. funds) per foot, the weekly rate is $3.71 per foot and the monthly rate is $14.31 per foot. Longer-term rates are $13.45 per foot for three to six months; $12.60 per foot for longer than six months. These prices are calculated from pesos using the most recent ratio of $1:12.2371 pesos. Near Loreto, Marina Turistica Puerto Escondido has 119 moorings set in the bay — a unique feature in the Fonatur group. Hidden Port Yacht Club at Puerto Escondido has lobbied to keep prices lowered at that facility. All of the Marinas Turistica offer 15 to 40 full-service slips, a floating fuel dock with diesel fuel and gasoline, a swimming pool, showers, a laundry, a boaters’ lounge, full-time security, uniformed staff and an office. Some of the marinas also have restaurants, shops, dry storage and repair yards with a sling lift.